Perfect for self-service stations or back-of-house applications, condiment supplies are ideal tools for putting finishing touches on your meals. 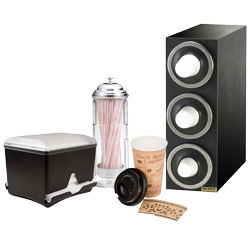 Prepare beverages to go or organize your self-service drink station with the help of these beverage and soda supplies. With fast food coffee supplies, you can provide on-the-go customers with all the supplies they need to grab a quick cafe beverage. Choose from a variety of available fast food bags and boxes to find the best containers for serving classic foods like hamburgers, subs, and hot dogs. Use serving supplies like trays, baskets, and liners to efficiently serve your foods in an appealing manner. Self-serve supplies allow your customers to help themselves to necessities like utensils and napkins. Whether your restaurant serves hamburgers, barbecue, or sub sandwiches, we have the fast food restaurant supplies you need to make your service efficient. These products are designed to keep your establishment organized in both the front and back of the house. We even have items specifically for your coffee service. For related products, check out our countertop food warmers, fry dump stations, and glass door merchandising refrigerators. If you're wondering where to buy fast food restaurant supplies, we have a large selection of fast food restaurant supplies for sale at the lowest prices. 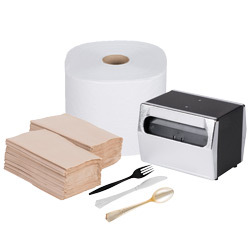 From restaurants to rest stops, virtually all businesses require dispenser napkins for one purpose or another. By choosing the napkin that's best suited for your business, you can build your brand, minimize waste, and offer a convenient solution to your customers' needs. Selecting the right type might not be easy; the options are as endless as the needs they meet. Whether you've opened a new business and just started shopping, or if you're in need of a new supply for refilling purposes, this guide will help you decode the meaning behind each fold's name. From practical to purposeful, disposable cups come in a myriad of materials, styles, sizes, and colors. However, with all the options out there, how do you know what type of cup is right for you ? Let's start by covering some basic terminology. 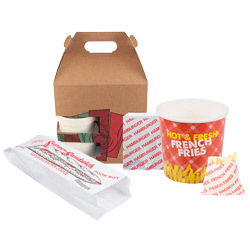 Perfect for establishments with quick, convenient service, these fast food restaurant supplies have everything you need to complete your dine-in, take-out, or delivery orders. 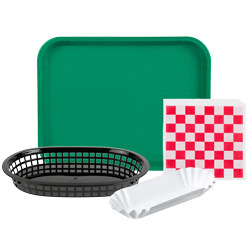 Start with serving supplies like paper food trays and plastic food baskets with compatible liners to create a simple, casual presentation that keeps your service efficient during mealtime rushes. We offer a variety of food bags, boxes, and buckets to provide you with packaging that accommodates menu items ranging from hamburgers and hot dogs to fried chicken and sub sandwiches. Allow your customers to customize their orders with condiment supplies including pump condiment dispensers and portion cups, or choose convenient condiment portion control packs that are also useful for take-out orders. You can keep your station organized with condiment bins, bars, and holders that make every option visible to your customers. With self-service fast food restaurant supplies like plastic flatware and napkin dispensers, your patrons can grab the tools they need to enjoy their meals. 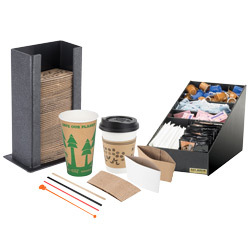 To provide an efficient beverage service, try our cup, lid, and straw organizers that are useful for front- or back-of-house applications. We have take-out cup carriers and coffee cup sleeves that help your guests on the go. 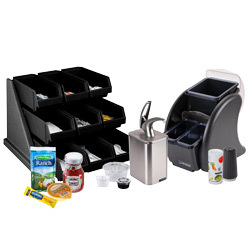 Plus, you can choose from a variety of countertop holders to organize your coffee condiments and cups at self-service beverage stations.